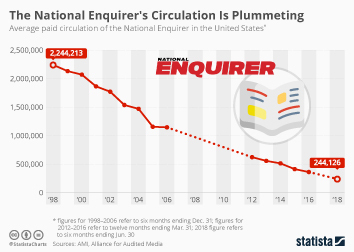 The estimated aggregate revenue of U.S. based periodical publishers has fallen sharply in the past decade from 46 billion U.S. dollars in 2007 to around 28 billion in 2017. Americans spent an average of 24 minutes reading magazines on a daily basis in 2010. This figure is forecast to decline to 15 minutes by 2018. Although the time spent with magazines is declining, the number of magazine readers in the U.S. has seen a slight increased since 2012. The number of magazines in the U.S. has also stayed fairly constant over the years, varying from around 7,100 to 7,300 since 2008. The success of a magazine can be measured in a variety of ways such as circulation, digital replica circulation, revenue by platform, revenue, and annual growth. Entrepreneur, an American magazine who’s topic is best explained by its title, was the fastest growing magazine brand in the U.S. in 2017. Science magazine, Popular Science, and home magazine, Town & Country, were also among the list of fast growing magazine brands. ESPN The Magazine, a biweekly sports magazine published by the ESPN sports network, has the largest reach among popular magazines in the United States. People Magazine has the second largest reach in the country, followed by WebMD. These leading magazines are also strengthening their presence on digital platforms, with WebMD even originating as a website before adding a print version. ESPN The Magazine is also the magazine with largest online audience in the U.S, followed by WebMD in second place. Many numbers in the magazine industry seem to be in steep decline, but advertising revenue has remained relatively consistent since 2010. In regards to ad spending, French cosmetics company L'Oréal was the leading magazine advertiser in the U.S. in 2017. That year, L'Oréal alone spent around 700 million U.S. dollars on magazine ads. Proctor & Gamble Co. ranked second with over 560 million dollars in ad spending, and many other companies such as Pfizer, Kraft Heinz, and Louis Vuitton spent hundreds of millions as well. Audience of People magazine 90.95mn Audience of ESPN The Magazine 123.3mn Fastest growing magazine brand "Entrepeneur"